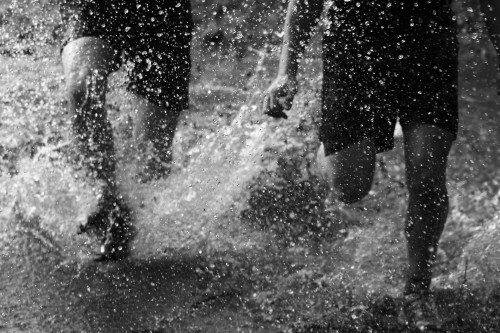 The Wolf Run offers a unique opportunity for running devotees to challenge their fitness and strength levels. Whilst the Run organisers are shrouding the course in mystery, what we do know is that it will be off road, over obstacles, through water and it’s safe to say - it’s probably going to be pretty tough. But will an off-road obstacle based run like the Wolf Run really need much specific training, and if so, how does a runner prepare for a race like this? Let’s think about a typical runner’s training patterns. Through winter, we tend to pound our way over miles of treadmill belt, with its soft cushioning effect, steady inclines and even surface. When the days get warmer and lighter we venture back to our favourite routes around our homes, or to and from work. These well worn circuits will also mostly be on pavements or footpaths - even surfaces with no camber, obstacles or surprises (save for the odd small child on a scooter). We choose our routes so we can run on auto pilot, because let’s face it, running is hard enough without throwing in a difficult or challenging environment. Off road running takes us away from moving primarily in a sagittal plane (front and backwards) and forces us to move in all three cardinal planes - sagittal, frontal (from side to side) and vertical (as we go up and over obstacles). Instead of relying on strong quads, glutes, hamstrings and calves to get us over the distance, we need a good core as we’ll be using our full body and our stabiliser muscles in our legs, ankles and feet become much more important in keeping us upright and balanced. Off road running takes no prisoners - if you’ve got a biomechanical or muscular weakness, by the end of an off road run, you’ll know about it! The good news is that running on soft surfaces reduces the impact on your body as you run and also requires more energy, making it an effective alternative to road/treadmill running. I’ve prepared some suggestions for additions you might like to incorporate into your running and gym workouts to help prepare you for the Wolf Run. Start by making one of your weekly runs on a soft surface. Grass, dirt or track running will get your feet used to working a bit harder every time they hit an uneven patch. If you can find a gently rolling course, this will also help your legs adapt to changes in incline. Practise widening your stride for ten steps, and shortening them to fast feet, periodically throughout your run. We get very used to running in our ‘rhythm’ but off road running will take this comfort away as you negotiate the course, so ensure your body is ready for it. Downhill running causes muscles to contract eccentrically and over-striding is a common mistake - try to practise keeping your stride length measured and controlling your descent - your knees will thank you for it. Try breaking up your run with some plyometric exercises (fast, powerful movements) after ten, twenty and forty minutes. Bunny hops, side jumps, jump squats and jumping lunges will all increase the intensity of your workout. Try thirty seconds of two of the exercises above and then pick up your normal running pace straight away. This will get your legs used to running through the higher levels of lactic acid that will have been produced during the plyometrics. Take off your trainers and socks and stand in your bare feet in front of a mirror. Now stand on one leg, and watch the small stabiliser muscles that have to fire to keep you upright - all around your ankle, lower leg and in your feet. Standing for a count of 30 seconds helps activate these muscles and strengthen them. To make it more difficult, try closing your eyes for a count of 20 seconds. Without a visual horizon, your balance will be even more difficult to maintain. Keep practicing this for both legs. By training your proprioceptors, it should become easier to maintain stability, as your sensory and motor nerves will be more awake and able to react to uneven surfaces. Single leg training can be incorporated into other exercises. For a simple single leg squat, stand on a bench which is around knee height. Holding your arms out in front of you, and keeping your torso as upright as possible, bend your weight bearing knee and lower your other heel until it touches the floor, then push back up. Perform this slowly and with control. If you aren’t sure how to do this, it’s best to ask a personal trainer at your gym to show you the exercise and how to do it without compromising good form. Uphill running stretches out the Achilles tendon and calf muscles while they are under load and pulls the pelvis backward, extending the back. Doing lunges onto box steps or on an inclined treadmill will prepare your lower legs. To train your lower back and glutes, lie on your front looking straight down at the floor, with your hands by your sides. Lift your chest a few inches off the floor, hold and slowly lower. Repeat this ten times. Do some core strength work. Off road running really will use more of your core muscles around your trunk than you are used to. Planks, side planks and crunches will strengthen your superficial and deep abdominal muscles as well as your obliques (around your sides). Spend 30 seconds trying to hold each position and finish with ten crunches. Make sure not to forget your back - more of the lower back raises (see above) will keep your spine straight and strong. By far the best preparation for off road running is of course, off road running! Jogging around your local fields (stick to foot paths unless you’re good friends with your local farmer), along the beach or across your local park will challenge your fitness and wake up your brain. Don’t avoid the small inclines and hills, charge up them. Break away from the other joggers on the path and you’ll be leading the pack on the 24th September.